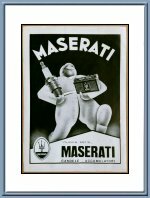 Vintage 1948 Maserati Candele and Accumulatori Advertisement. 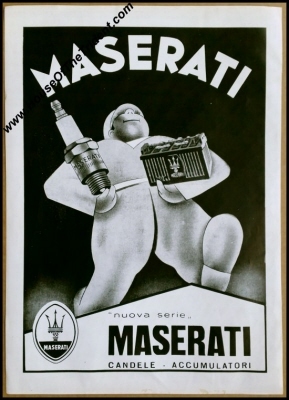 Here we have a fantastic collectible for the Maserati fanatic... a vintage 1948 advertisement for Maserati's "accessories" such as their sparking plugs and car batteries. It was taken from a vintage Italian magazine and would otherwise have gone lost if not somebody regarded this ad special enough to save for more than six decades! It s a full page ad and it measures approximately 24 x 34 cm or roughly 9.4 x 4.7 inches and has is in excellent condition for its age but the photo is of the actual ad so please be your own judge on its condition..
We have only 1 available of course. Vintage 1948 Maserati A6 1500 advertisement. 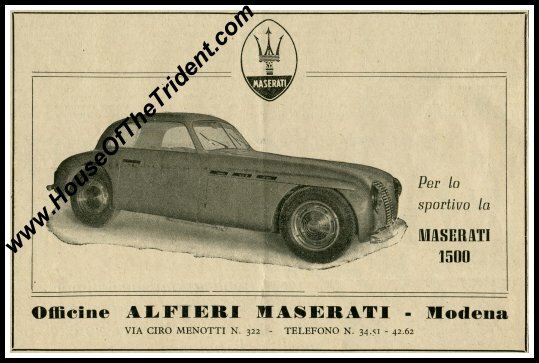 Here we have a fantastic collectible for the Maserati fanatic... a vintage 1948 advertisement for Maserati's first-ever road car, the A6 1500! It shows the car with the early style Pininfarina body with its distinctive 3 portholes and 2 side-window arrangement. With only 61 cars made over the 3-year period that spans 1947 - 1950, this is a rare find indeed that would look even more fantastic when properly framed. It measures approximately 18.5 x 12 cm or roughly 7.3 x 4.7 inches and has a slight fold from the original magazine vertically down the middle (visible in the scan). Vintage Maserati 3500 GT Spyder Press Photo. 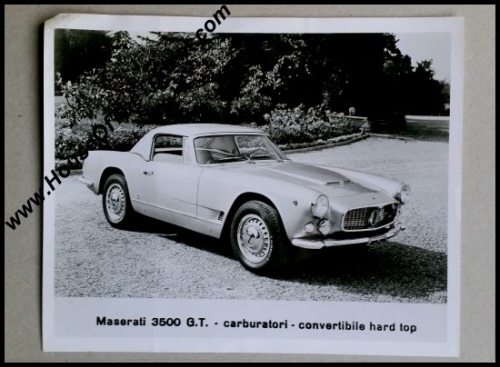 This is a vintage press photo of the 3500 Vignale Spider with hard top. 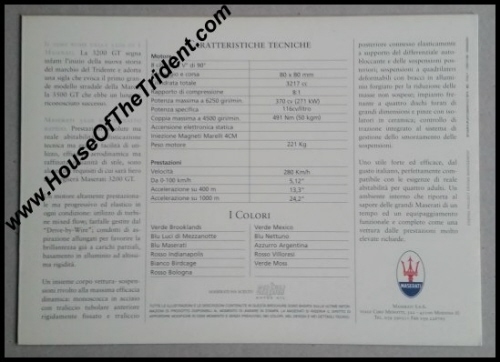 The caption reads "Maserati 3500 G.T. - carburatori - convertible hard top - ". The photo measures some 25.5 x 20.5 cm or 10 x 8 inches. 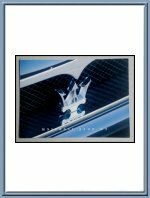 Maserati 3200 GT Introduction Brochure. 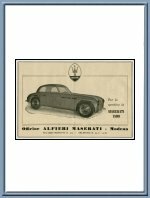 This is a Maserati factory original "short" brochure that was produced to give a brief introduction for the then-new Maserati 3200GT. It measures some 21 x 15 cm (8 x 6 inches) and folds open to 84 cm x 15 cm (32 x 6 inches) with the inside showing some stunning photography. The rear panel lists technical characteristics, colors etc. 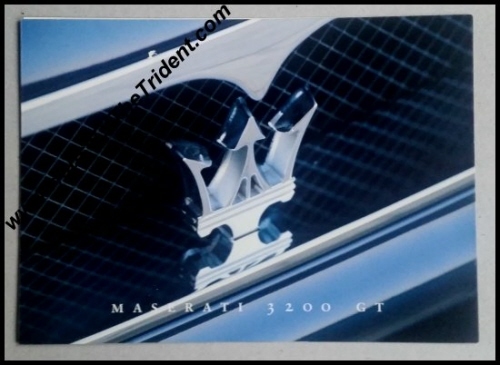 Maserati print number 920000281, published in November 1998. It is an official Maserati factory issue. It is in near mint condition for its age with a tiny spot to the front cover (visible in the picture) hence the small price. We offer FREE packing, handling & shipping to ANY destination in the world on this brochure. 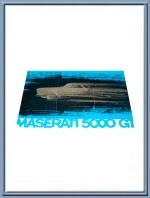 Vintage ca 1959 Maserati 5000 GT Sales Brochure. 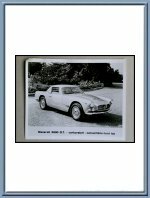 A great vintage, and very rare, brochure for the Maserati 5000GT Coupe. It measures approximately 12 x 8 inches or 30 x 20 cm and folds open to twice that size. 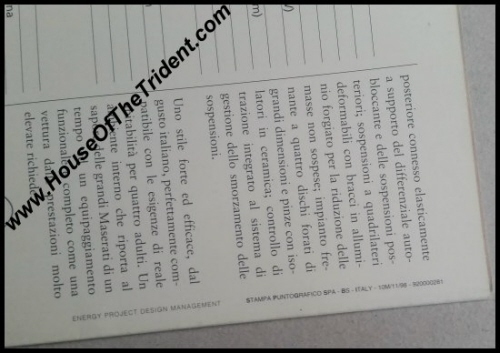 Italian Language with technical specifications in Italian, French, English and German. 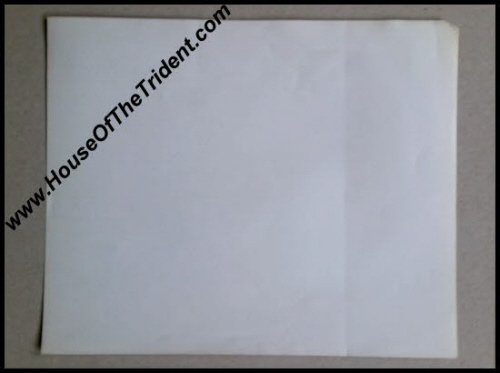 Good condition but has been have been folded twice, vertically, for mailing and a small piece is torn off the bottom left corner, as visible in the second photograph. NOT listed in Hilary Raab Jr.'s book "Maserati Brochures & Sales Literature".